Author Michael Collins Piper’s famous work Final Judgment is being reintroduced by American Free Press for the first time in many years. The book is currently at the printer, but you can advance order copies in our shopping cart starting today. Order now and get free media-mail shipping on all orders of the book in the United States. In the years before Michael Collins Piper passed away on May 30, 2015, in Coeur d’Alene, Idaho, he told many of us here at AFP that he was working on some minor updates for his highly acclaimed book, Final Judgment. He wanted to reintroduce the book, which was already in its sixth edition, because he knew it was nearly impossible to get it anymore. Sadly, that never came to fruition before his unfortunate death, and you can now only find used copies on the Internet, at very, very steep prices. Over the years, we can’t think of any other book in our inventory that readers have requested as much as Final Judgment. However, at over 800 pages, the sheer size of the book has made republishing it a daunting effort, and we have repeatedly hedged, telling people that, some day soon, we hope we’ll have it back in print. Well, we have good news to report today. We are offering print copies of Mike’s incredible book once again—only this time we will be breaking it up into two manageable volumes of around 400 pages each. At this size, it will be easier to read and we have been told that the book binding will hold up for many more years than if we tried to cram over 800 pages into one softcover book. For those who don’t know, Final Judgment is considered to be one of the definitive books on the assassination of President John F. Kennedy. Through meticulous research, Mike pieced together multiple disparate theories on who was behind the murder, ultimately placing the blame for orchestrating this tragic event and the resultant cover-up on the Israeli government. Not surprisingly, the story is complicated. But, according to Mike, the reason Kennedy was in the crosshairs was largely due to his unwavering opposition to Israel getting the atomic bomb. To this day, Mike’s book still stands the test of time. Of course, it is well known in conspiracy circles. But Final Judgment has also been cited by court historians and mainstream researchers, who find that Mike’s logical conclusions and in-depth analysis play an important role in finding out what really happened on that fateful day in Dallas. If you would like to help us fund this project by ordering copies in advance, that would be much appreciated. Volume I contains the main text of the Final Judgment book plus Mike’s amazing photo section. It is 425 pages and will sell for $25 plus $4 S&H in the U.S. Volume 2 comprises the 10 extremely detailed appendices referenced again and again in the main body of the book. Volume 2 is 374 pages and will also sell for $25 plus $4 S&H in the U.S. However, if you want to advance purchase the two-volume set right now, we will get it to you when it comes off the presses in about a month for just $40—and we’ll pay the S&H anywhere in the U.S. until March 1, 2017. We also want to thank Mike’s good friend Prof. Ray Goodwin of Texas, an indomitable JFK researcher himself, who agreed to write the foreword to this 2017 commemorative edition. Ray is a strong supporter of Mike’s work and is a member of The Barnes Review history magazine’s editorial board. 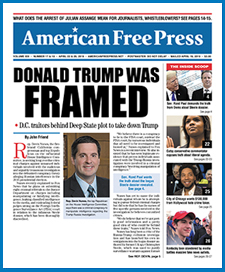 To order in advance, click here, call 1-888-699-NEWS to charge, or send payment to AMERICAN FREE PRESS, 16000 Trade Zone Ave., Unit 406, Upper Marlboro, Md. 20774. Please write “Final Judgment 2017” on the memo line. Christopher J. Petherick is the executive editor at American Free Press. It does not include the changes Mike wanted to make shortly before he died. Sadly, those seem to be lost forever. We will turn this into an e-book and offer it for sale soon. We’ll send out a notice when it has been converted. Is the Author’s minor edits part of the new printing? My bookshelves are bulging w 45 yrs of reading; please do an ebook. I don’t buy any physical books anymore if an digital copy is available.